Tuscan olive oil and Tuscan bread (saltless) have always formed the staff of life in Tuscany and continue to this day to be major and essential components of the Tuscan diet. 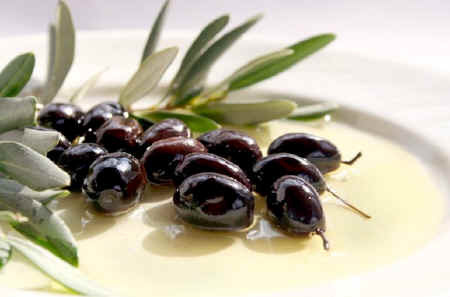 Olive oil is used both "raw" as a condiment on bread, salads, tomatoes etc and extensively in cooking. In contrast, use of butter is very limited in Tuscan cuisine. The Tuscan olive oil of choice is "extra vergine" - extra virgin - the highest possible quality olive oil, with free fatty acid content below 0.3%. Below, we give some olive oil grading information relating to various retail markets, but the long and short of it is that you must know exactly where your olive oil is coming from, because the regulation of olive oil quality can be extremely lax and corrupt, including in Italy. It is therefore crucial that you trust the source of your oil. Obviously, if you live in Tuscany, you can grow your own olives - most families with a patch of ground do exactly this - and if you are visiting, you can and should buy your oil directly from a grower. This is quite easy, because almost every wine producer also produces olive oil so that oil can be bought at any of the very numerous "Vendita Diretta" and "Degustazione" places dotted along the country roads of Tuscany. If you buy from a supermarket, read the label carefully - it should say extravirgin olive oil produced in Tuscany. Be suspicious of low prices - the oil will be either old or not coming from where it should. Next - olive oil, unlike many wines, does not get better with age. The fresher the oil is, the better the taste, and, indeed, olive oil still within three months of harvest is known as "olio nuovo" - new oil - and is extremely popular because of its peppery flavour, the product of the phenols, anti-oxidants and other volatiles that are so good for us. The olive harvest usually takes place in late October and early November, so that the olive oils on sale around the end of the year and early new year are best. Olive oil remains perfectly acceptable for a full year, but most domestic producers press just enough oil to last their family and friends until the next harvest. Do not buy olive oil sold in clear bottles. Dark green bottles help prevent breakdown caused by light and no reputable producer will market his olive oil in a clear bottle. Keep your oil container tightly sealed - oxidation is a major contributor to the degradation of olive oil. Occasionally an olive crop fails and consumers have to resort to commercial suppliers. 2011 was such a year in Chianti. There was so little rain throughout the summer that the olives were little more than skin and stone. Many small growers didn't even bother to pick the olives. Some older expressions used in relation to olive oil include "cold pressed", an old term that refers to the days when oil was pressed from the fruit pasta using a large mechanical press. These presses are still around, but not used much because they expose the oil to too much air. This oxidises some of the important phenols and anti-oxidants. "First press" is another old term used to describe the oil produced by the first pressing using the mechanical presses. The pasta was then pressed again to produce a poorer quality oil. Modern olive presses, usually belonging to the local municipality or groups of "associates", and to which small producers take their baskets of olives to be pressed, are much better than the old presses. They separate the oil and water from the olives during the pressing process, keep air out of the procedure and maintain a low temperature. The "pasta" left after the first press is usually left behind for extraction of lower grade oil used in commercial cookery. In summary, for all purposes, try to obtain the freshest, genuine Tuscan, extravirgin olive oil, and keep it in a cool, dark storage space to stop it going rancid. At refrigerator temperatures, some olive oil constituents start to crystalise - waxes, for example - and the oil becomes opaque. The oil is apparently not harmed by this process which is readily reversible. Olive oil is a blend of virgin oil and refined oil, of no more than 1.5% acidity. It commonly lacks a strong flavour. Olive-pomace oil is a blend of refined pomace olive oil and possibly some virgin oil. It is fit for consumption, but may not be described simply as olive oil. Olive-pomace oil is rarely sold at retail. It is often used for certain kinds of cooking in restaurants. Lampante oil is olive oil not suitable as food. The expression lampante comes from olive oil's long-standing use in oil-burning lamps. Lampante oil is mostly used in the industrial market. Pay attention to the wording on olive oil labels outside of Italy. "Light olive oil" means refined olive oil, with less flavour. "First cold press" means that the oil in bottles with this label is the first oil that came from the first press of the olives. The word "cold" is important because if heat is used, the olive oil's chemistry is changed. It should be noted that extra-virgin olive oil is cold pressed, but not necessarily all first oils are cold pressed. The label may indicate that the oil was bottled or packed in a stated country. This does not necessarily mean that the oil was produced there nor that the olives grew there. The origin of the oil may sometimes be marked elsewhere on the label. It might be a mixture of oils from more than one country, and olives are sometimes trucked over provincial borders in order to be pressed in a more prestigious zone. As the United States is not a member, the IOOC retail grades have no legal meaning in the US. Terms such as "extra virgin" may be used without legal restrictions. U.S. Grade A or U.S. Fancy possesses a free fatty acid content of not more than 1.4% and is "free from defects"
U.S. Grade B or U.S. Choice possesses a free fatty acid content of not more than 2.5% and is "reasonably free from defects"
U.S. Grade C or U.S. Standard possesses a free fatty acid content of not more than 3.0% and is "fairly free from defects"
U.S. Grade D or U.S. Substandard possesses a free fatty acid content greater than 3.0% "fails to meet the requirements of U.S. Grade C"
Podere Patrignone is a family-run olive farm, just 5 km from Castellina in Chianti, surrounded by forests, vineyards and 800 olive trees. We make our own 100% organic extra virgin olive oil, which we sell world-wide to our loyal customers. Podere Patrignone also offers five Tuscany vacation apartments to rent (1 bedroom and 2 bedrooms, sleeping 2 and 6 people), and a large Tuscan vacation villa to rent for 8 to 14 people in 7 bedrooms. Every bedroom has its own bathroom. In total, Podere Patrignone sleeps 32, which is great for weddings, celebrations and reunions. The swimming pool has a 360 degree view across the Val d'Elsa towards the sunset, San Gimignano and the Apennines. It’s a quiet, stunning place, within easy reach of the main tourist attractions of Chianti and elsewhere in Tuscany. More about Podere Padrignone and its olive oil. In addition to being an olive oil producer, Podere Capiteto offers three vacation apartments for 2 (+1) persons. We are located just 3 km from Impruneta and within easy reach of Florence (20 minutes) by bus. Enjoy the tranquility of the countryside while still being able to visit the museums and churches of Florence. Horses for horseback excursions may be rented at the neighbouring property. Our olive orchard is an ideal area for children to run free in safety. More about Podere Capiteto and its olive oil. Podere Sagna, formerly a simple farm, has been carefully restored into a beautiful farming residence. The estate is located just outside Castellina in Chianti. The residence is surrounded by 50 ha of farmland, including organic olive orchards. The owner lives in the main building, which dates back to the 13 C. Three holiday apartments for 2 to 6 persons are offered. More about Podere Sagna. Podere Felceto is a spacious, traditional, stone Tuscan villa originally built as a monastery in the 15 C and located 2.5 Km from Panzano in Chianti. The farmhouse and other buildings are surrounded by a large organic olive orchard. The main house sleeps up to 15 persons. Podere Felceto can arrange an olive oil evening in their own cantina for guests staying at their agriturismo. These evenings consist of an introductory talk about how to distinguish the good, the bad and the ugly among olive oils, followed by a light meal utilising plenty of their organic olive oil. More about Podere Felceto olive oil evenings. Copyright © ammonet InfoTech 2009 - 2018. All rights reserved.